Back in 2008 when Lewis Moody was playing for Leicester Tigers, he took half an hour out of his time to chat to Rugby World about, Christmas plans, pre-game routines, nicknames, and the ‘pick me up’. RUGBY WORLD: What’s the funniest thing you’ve seen or heard on the field? RW: Christmas is just around the corner. Have you got any big plans? LM: A couple of years ago Paddy Howard asked myself and Sam Vesty to organise secret Santa for the boys. I remember Austin [Healey] got Matt Dawson’s book and Benny [Kay] got Johnno’s. Leon Lloyd came up with the best, buying Julian White (a farmer) a shepherd’s crook. This year I think we’re going for a medieval banquet. On the present front, last year I got some tattoo sleeves from the family, which were legendary, and my wife Annie’s brother, John, carved a tiger’s head out of metal, which was pretty impressive! LM: I seem to get so many, especially after Brian Ashton called me ‘Mad Dog’ during the World Cup. But most people call me Moodoss. Some people call me Lewju as my dad is also called Lewis. LM: George Chuter is definitely the funniest and he has me cracking up all the time. We do have a thing called the ‘pick me up’, which I think I invented. If someone is wandering around looking a bit down at training they generally get snuck up on and receive a massive slap on the arse, often from a 20-metre run-up. Julian White is normally the victim of this one from me. He needs some livening up in the morning! RW: What about these outrageous moustaches the boys have had? 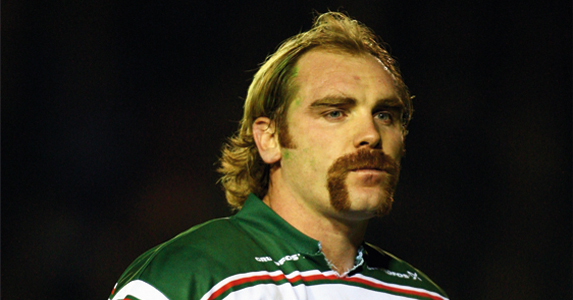 LM: Loads of us agreed to grow moustaches for the Matt Hampson Trust and clearly Andy Goode had the most success. I did try it for the Leinster game, but it came out all wispy so I just had to shave it off. RW: Do you like breast, bum or legs? LM: Well, as Annie is pregnant at the moment it’s all about the bump! LM: I’ve always wanted to have a conversation with Neville Southall [ex-Everton and Wales goalkeeper]. If I ever admired a footballer it was him because of the way he played, and once he’d retired I stopped watching. RW: What’s your pre-game routine? LM: I like to go to the cinema the night before a game, sit in the same place in the Leicester changing room, have half a can of Red Bull before I go out and I always warm up with my match shirt on under my warm-up top. Goodey always has a latte (Starbucks preferably) before a game, but also proceeds to throw up loads of times as he gets ready. LM: Loud chewing is a big one. I used to share a flat with James Overend and he had the habit of chewing the plastic tops off bottles, all day. LM: People obviously. But then it’d be my mobile as my life exists inside that. Oh yes, I’d save my World Cup winners’ medal and shirt from the final!